Currently in public beta, Upthere is a sync-free cloud storage service for photos, videos, music, and just about anything else on OS X, iPhone, or Android. Like it or not, cloud storage is the future, despite the fact that even major players with deep pockets haven’t quite nailed it yet. Now that Dropbox has come down to Earth on pricing and capacity, it’s generally considered superior to competing services from Amazon, Google, and Apple—and don’t even get me started on Microsoft, who recently reneged on its promise of unlimited storage for Office 365 subscribers. Last month, a new player named Upthere burst onto the scene offering an alternative, sync-free “cloud computer.” Currently available free with unlimited storage while in beta (the company has yet to announce pricing), Upthere does have at least one ace up its sleeve: Founder and former Apple vice-president Bertrand Serlet, who worked as software engineering lieutenant under Steve Jobs for more than two decades. Sharing is a snap from Upthere Home for Mac, including the option to make content viewable on the web to anyone with a link. I managed to get in on the beta and spent a couple weeks putting Upthere through its paces. While not yet as robust as other cloud storage players, the service shows plenty of promise—but without a sync component, it could wind up hamstrung by data caps and a lack of fast, ubiquitous internet. 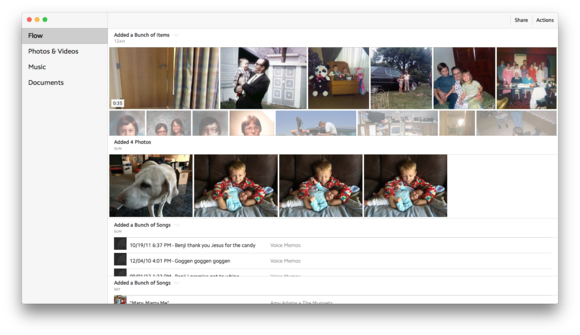 Upthere Home for iPhone is nearly identical to the Mac version, including a unified view of photos and videos. 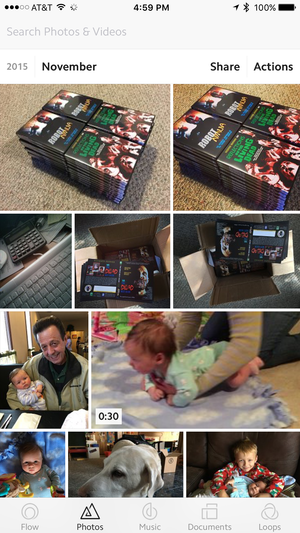 Upthere is currently accessible from Mac or a trio of mobile apps. The OS X client, Upthere Home, monitors Photos, Aperture, Photo Booth, or iTunes libraries for new content and uploads it automatically; there’s also an iPhone version that does the same for your Camera Roll, a companion Upthere Camera app for direct uploading of photos as they’re shot, and a unified Home & Camera app for Android. Upthere Home splits uploaded content into four areas: Flow, an activity monitor for files that have been added or shared; Photos & Videos, which displays both media types in one consolidated view; Music, sorted strictly by artist name; and Documents, where you can drag and drop files such as documents that don’t fit into other categories. Uploaded files remain private until shared with friends or family as Loops, which are displayed underneath the main categories on the Mac, or in a separate tab on mobile. The all-white user interface is quite straightforward, intuitive, and easy to use; sharing requires only a name or email address. During the beta period, anyone you share with can also use Upthere free of charge. At launch, there’s no web component, but shared photos can optionally be set to appear online from the Details tab, making them viewable to anyone with the public link. 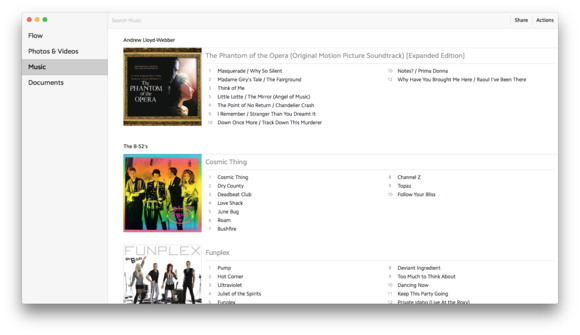 Music is sorted only by artist on Upthere Home for Mac, but users can find albums or songs in a snap via search. On a 5 Mbps broadband connection, it took most of the weekend to upload more than 18,000 photos, around 30 videos, and my nearly 71GB iTunes library from a MacBook Pro running night and day. The Mac uploader completely locked up on several occasions, but I was able to pick up right where I left off after the software rescanned the connected application libraries (15 to 20 minutes in my case). Although photos displayed just fine, videos wouldn’t play at all unless downloaded first, which kind of defeats the purpose of using a cloud service. On the surface, Upthere isn’t significantly different from rival services—in fact, it’s downright underpowered in some ways. On the Mac, there’s no central folder for syncing files like iCloud Drive, Dropbox, or OneDrive, and desktop content can’t be mirrored like SugarSync or Bitcasa either. This is by design: Upthere was designed as a central cloud repository for all of your files. Upthere Camera for iPhone offers a simple way to snap pictures that bypass device storage and go straight to the cloud instead. Although Upthere Home can be configured to automatically upload Camera Roll images, new photos can also be taken with Upthere Camera, which pushes full-resolution images straight to the cloud. None of the apps offer built-in image editing, although users can view metadata such as time/date and location. 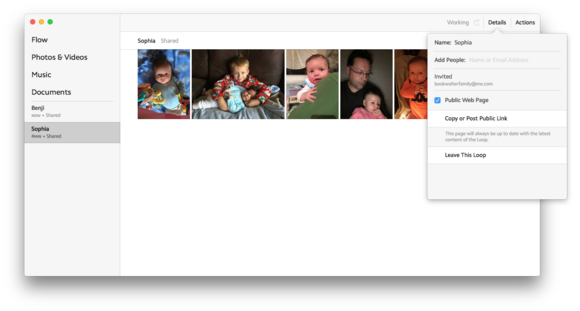 There’s also an option to store new photos in your Camera Roll, but this has to be turned on prior to taking pictures or they’ll only appear in the cloud; in my tests, Upthere Home was smart enough to skip any duplicates that exist in both places. The concept of a cloud camera isn’t particularly new: StreamNation has offered an unlimited, free storage in its Shutter app for several years. What makes Upthere Camera unique is the ability to take photos directly into existing Loops. 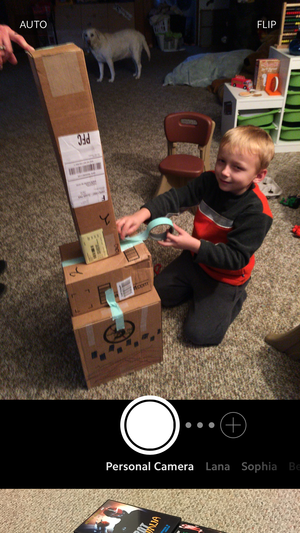 Create a new shared camera (or swipe to select an existing one), snap a picture, and it’s instantly shared with everyone in that group. Other than this neat trick, Upthere Camera is a no-frills affair—so basic, in fact, I’m surprised the developers didn’t roll its functionality into the Upthere Home app like they did on Android. For now, Upthere Camera doesn’t shoot video (although Upthere Home will upload anything shot with the built-in camera app), and neither iPhone app works natively on iPad at this time; support for additional platforms is planned. Upthere Home for Mac consolidates all current and past activity into a single Flow view where users can see what’s being added or shared. As the latest contender to the cloud storage throne, Upthere is off to a promising start. Mac uploader bugs aside, the service is quite polished for a beta, and sharing content is about as frictionless as it gets. But the verdict is still out on how much it will cost, and whether consumers want to entrust their content to yet another fledgling startup.